Burritos can contain pretty much anything, but the key thing is a good flour tortilla - the best ones are home-made, so I'm showing you how to do that here. In a mixing bowl, combine the flour, salt and baking powder, then add the water and stir until it has formed a ball of dough. Tip the dough out onto a floured work surface and knead the dough for 5-10 minutes until smooth and elastic. Divide into 12 golfball-sized pieces and roll each one to create a neat sphere. Place them on a greaseproof-paper-lined baking sheet, cover with a clean tea-towel, and leave to rest for half an hour. After resting, use a rolling pin to roll each ball into a disc about 20cm (8 inches) across. As you roll each one, dust it with flour and stack it with the others. Keep the stack covered with the tea-towel so they don't dry out. Heat a dry frying-pan or skillet to medium-heat. Place one of your tortillas on it, cook for 30 seconds or so, turn it over, cook for another 30 seconds, then throw it away, because your first 1 or 2 will always be rubbish. Once you've got the heat right, your tortillas should bubble up a little as they cook and the tops of the bubbles will darken. Stack your cooked tortillas on a plate and keep them covered with that old tea-towel - this will help keep them soft. What you put into your burrito is entirely up to you, but for this one I heated up some leftover chilli con carne and rice, piled them onto a tortilla and topped them with grated cheddar cheese. I then blowtorched the cheese to melt it. You can add lettuce to your burrito if you like. Fold the ends of the burrito up over the filling, and roll it up into a cigar. Serve with salad, salsa, and soured cream or yogurt. The video above is from the Keef Cooks YouTube channel. 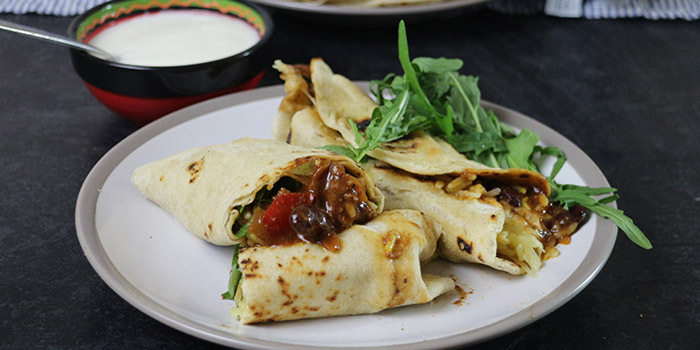 Click here to see the video recipe of Chilli and Cheese Burritos with Home-made Flour Tortillas on YouTube. Prep time: 20 minutes. Resting time: 28 minutes.